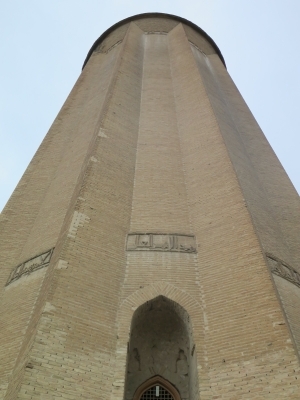 Gonbad-e Qābus is a monumental tomb tower, the earliest and tallest in this part of Asia. It was built in 1006 as a tomb for emir Qābus ibn Voshmgir, but no traces of remains have been found inside the tower. The 53 metres high tower was constructed using unglazed fired bricks. Its form is cylindrical, with a conical roof and standing on a stellar plan. It became the prototype for the construction of tomb towers in the history of Islamic Architecture. The tower is the only part that remains of the historic town of Jorjan. 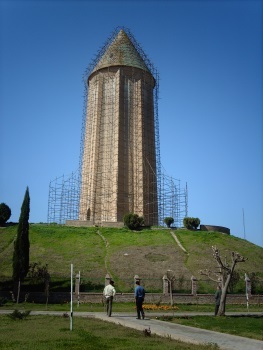 It stands on a domed hill in a park in the center of the current city Gonbad-e Qābus. A lot has been said in the below review that I can't really add much. The site is remote, even with he nearby forests/parks probably WHS soon, as well the “on paper” great wall of Gorgan to visit. I found a parking lot right at the site which acts as a fairground in summer. It also taught me that parking on the side of the road you need to be careful of the large gaps between road and side that act as...drainage? It was rainy but nothing compared to the snowy road from the south that had many people grabbing their snow chains quickly. So I made made it to the tower and looks pretty impressive but woah there is so little to see. I find myself reviewing bad sites more often but I suppose there are so many reviews for the “good” places. I am actually dishing out more stars than what is worth but I like towers. Indeed you get a leaflet about the site, walk up the ramp and read a couple of panels. Inside, I was so excited, is absolutely nothing! Well, air, and darkness, and a ceiling somewhere up there. If not for that I would probably be ok taking a picture from just outside the entrance like everyone else! So I spend a few more minutes walking around the tower, read the labs again, took more pictures and goodbye tower. I think I spent more time writing the review. As I said, if you want to spend more time on nearby attractions then it is worth coming otherwise no. A quick look at the map of Iran will indicate why Gonbad-e Qabus might not yet have been reviewed on this web site and indeed had only 5 recorded visits prior to ours! It is a long way off the route for visiting Iran’s other WHS! Which was a problem for us, as I had set myself the objective of visiting all of Iran’s WHS, other than Shahr-i Sokhta. So I swallowed hard and added 2 days to the end of our circular trip by car after taking in the other 17 – a distance from Tehran of over 500 kms each way. Over 1000 kms just to see a brick “tower”!?? Well – was it worth it? In purely objective terms I guess the answer must be “no” – even for that extra tick! But the trip contained enough other “interests” by taking us to a “new” area of Iran to make it just about worthwhile. Our outward journey took us past 5620m Mt Damavand and down to the Caspian coast at 24m below sea level! Gonbad itself is approached across a plain of wheat fields which predominate in this area SE of the Caspian. To the south, the hazy Elburz mountains create an amazing climatic change – across them, less than 100kms as the crow flies, lies largely empty “desert” Iran. On this side, the mountain slopes are forested and farmers tend rice paddy fields which look as if they could be in SE Asia. The next day, as we drove up into the mountains to cross over and take a different route back to Tehran (an additional 100kms! ), our driver/guide commented that this place was “Paradise” to Iranians with all its greenery and running water. Gonbad itself is a scratty, mainly modern, town of c 120k people undergoing the undistinguished expansion common across Iran in response to its recent massive population increase (On my previous visit to Iran in 1970 its population had been c25 million – it is currently c80 million and rising). It lies only 60kms from the Turkmenistan border and its population is significantly Turkmen. Whilst the women still cover their hair with a scarf as required by Iranian law, they are easily distinguishable by their bright colours and long slim dresses, in contrast to the more subdued hues and trousers/black of Iranians. Rather disappointingly the local men seem to have abandoned their Turkmen hats which we remembered from the other side of the border! a. pick up a couple of, not too informative, part Farsi/part English brochures – but you have to ask and the ticket seller was very reluctant to give us one since, apparently, it contained a numeric error in its Farsi/Arabic number section! b. see the displays which line the spiral ramp from the ticket office to the top of the mound showing some nice historic photos of the Tower from the 19th C onwards – including before/after its several “renovations” (c 1930-33, 1938-9 and 2006-7). Interestingly ICOMOS was critical of the ramp which had “slightly damaged the form of the mound”. c. enter the tower itself by its only door. Inside you will see ……an empty circular brick cavern reaching up into the dark and containing no decorations or features whatsoever apart from a dim light from a small window somewhere “up there”. Any plaster decoration which might once have existed has long gone. Legend holds that the tomb of Qabus was suspended from the roof and our guide claimed that there were indeed the remains of chains before one of the restorations. Whatever – apparently no tomb or any remains of such have ever been discovered despite excavations into the base and ICOMOS even suggested that “geo-radar” techniques might be used to investigate further! So that’s it – after around half an hour and a few circumambulations you will have seen it! You will have noted the fine raised brickwork which creates the commemorative inscriptions in Kufic calligraphy surrounding the tower at both low and high altitude. You will also have noted the 10 mathematically determined external triangular buttresses – their faces still “sharp” even after 1000 years. You may have picked up that the conical roof contains a twin shelled dome!! Beyond that – well you now have an entrée to the subject of “Tomb Towers” in Iran, Turkey etc. You can even see 2 more on your way back in Shahrud and Damghan. 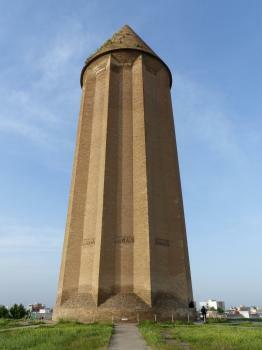 But, at Gonbad you have seen the giant “grand daddy” of this type of structure. But the Tower isn’t Gonbad’s only historic monument. In the suburbs lie the ruins of the ancient city of Jorjan or Gorgan (Not to be confused with modern Gorgan which lies almost 100kms to the SW) – but with little to see. More interesting to us were some remains of the “Great Wall of Gorgan” the World’s second longest defensive wall after the Great Wall of China situated just 3kms north - albeit that it is now little more than a long mound with occasional squares which were once forts! Indeed, the chance to add this to my seen list of “Walls of the World” helped me mentally “justify” this entire add-on excursion!! It was added to Iran's T List in Feb 2017. 14 Community Members have visited.